I love making handmade birthday cards for friends and loved ones. 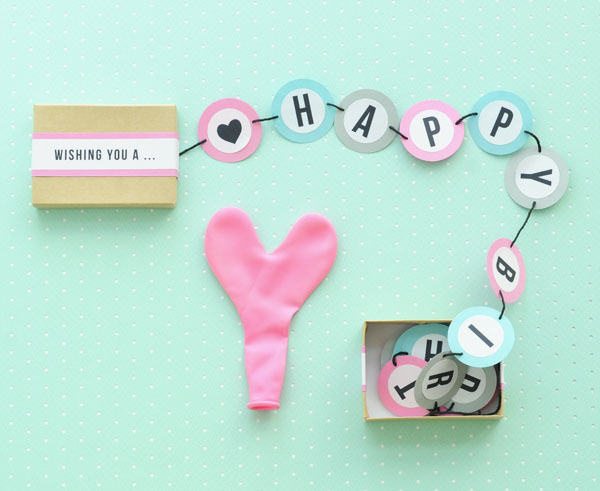 A fun twist on a handmade birthday card is a Happy Birthday Banner Box. Instead of giving a birthday card that will get filed away, make a sweet happy birthday banner that the birthday boy/girl can hang up to remember their special day. Step 1: Print letters to spell out HAPPY BIRTHDAY and birthday greetings onto white sticker paper. Cut out birthday greetings and two strips of colored text-weight paper. Step 2: Wrap colored paper strip around the box lid and secure on the inside with double stick tape. Repeat with bottom of box. Step 3: Remove backing of birthday greeting and place it on the colored paper strip. Repeat with bottom of box. 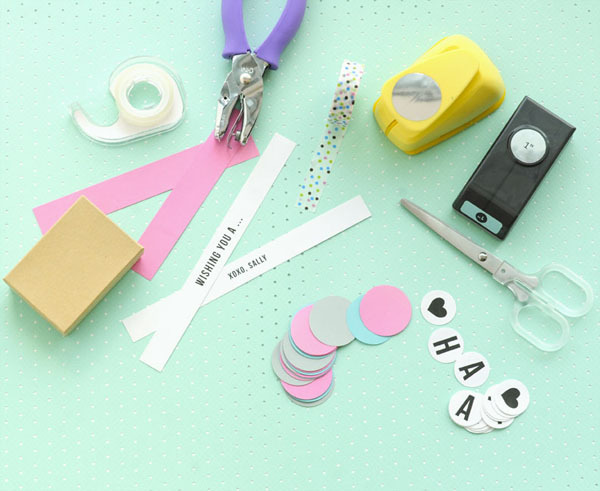 Step 4: Use 1” circle paper punch to cut out HAPPY BIRTHDAY letters. 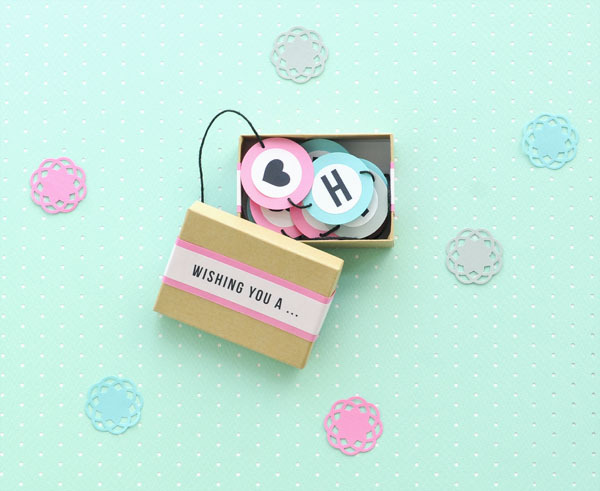 Use 1.5” circle paper punch to cut out 16 circles out of various colored cardstock. Place colored circles in the order you will use them for the banner. Step 5: Remove backing of HAPPY BIRTHDAY letters and adhere to the center of the colored paper circles. 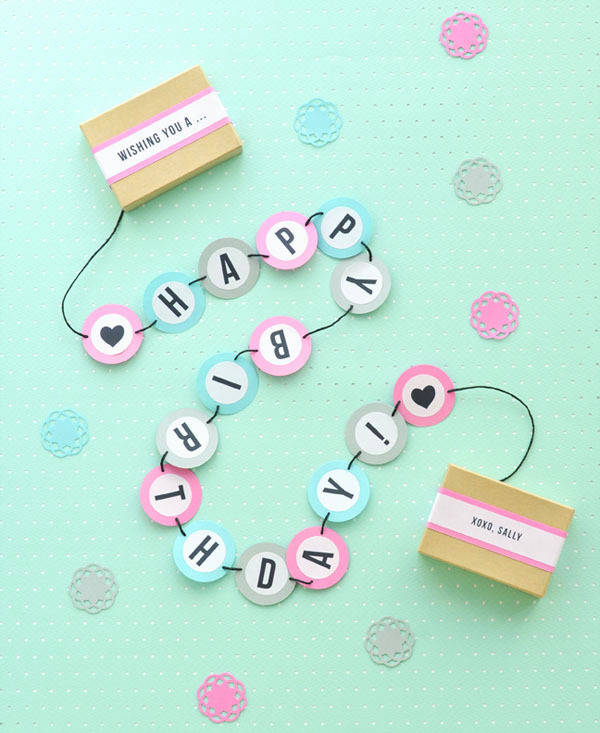 Step 6: Use 1/16” hole punch and punch two holes on each side of the HAPPY BIRTHDAY banner circles. Step 7: String twine through the holes to create the banner, leaving 12” on each end of the banner. Step 8: Wind up a 6” of string on the left side of the banner and secure to the lid with a piece of washi tape. Repeat with other side of banner and bottom of box. Step 9: Tuck garland into box and place lid on the box. Clever idea,and looks so simple! I love this, Sally! I’m going to give it a try. I also think it’s a great idea for New Years! Hope you try making one! It can be used for any holiday! I love sweet mail ideas like this! I may have to send a “happy holidays” version of this to someone this year! I’m planning to make some holiday ones, too! Have fun! aww so perfect and sweet! love it, sally! Thanks, Lyndsay! Hope you try making one! This is such a great and easy DIY. There’s so many variations possible! Very cute, Sally! And your styling is perfect. This is so so cute! I love this idea! I soooooo love this idea and will be using it to send to my Godson who lives in England. I’d love to recieve this in the mail myself! I hope it brightens your godson’s day when it receives it! I also wouldn’t mind receiving one of these in the mail! Wonderful Happy Birthday card! That’s so cute! I might do this for my son’s preschool teacher! Super idea! Thanks! I’m sure she would love to receive one! Perfect for those friends that you want to do something extra special for! I was actually wondering if you might share what hole punches you’ve used for the banner, and for the cut-outs used in styling? So handy! Thankyou so very much for sharing your ideas, and inspiring us. Thanks, Katelyn! I listed the size circle and hole punches I used for the project in the materials section (EK Success, Marvy Uchida, Martha Stewart are all good brands). The lace circle punch is from Martha Stewart crafts, which I purchased 3+ years ago and cannot find on their site now. Love this! Off to make it for my daughter’s 20th birthday which she is celebrating away at college. That is so sweet! Hope she loves it! there are so many occasions that you can use this clever idea! I’m all over it for Valentines!! Yes! You can make one for any holiday or special occasion! Yes, I’m definitely going to make these for my friends and family. I love the colors you used too! Thank you for sharing! Such a pretty idea!~ <3 I love your blog and I am a new reader, your ideas helped me a lot during my housewarming party. That’s a fantastic idea – I really love it. It’s already bookmarked and I can’t wait to create this little banner in a box. Thanks for sharing Sally! Oh my gosh! this is so cute. I can see me making the circles like baseballs to give to my boss — he’ll likely not know what to do with it and think it’s neat at the same time! Either way, I’m sure to enjoy his expression! What a delightful find!